Events — Sozo Group, Inc.
No Class on 10/28. 11/4 is last session. 11/11 is optional social gathering. Do you think you have more capacity for creativity than you are currently experiencing? If so, you’re not alone. One in four people believe they are not functioning to their full creative potential! The Sozo Creativity Workshop walks you through a 5-step model to help you unleash your creative potential. You will learn how to unlock your creative ability by identifying lies you believe about yourself and be healed from the wounds associated with them. This workshop contains exercises to help you establish a plan to move forward in your new freedom. Through the process, you will deepen your intimacy with your heavenly Father, who is the greatest Creator! The world is in need of desperate wisdom, beauty, and inspiration from heaven to be displayed on earth through you. There is no economic, gender or age limit on creativity. Start the journey now to unleash your unique expression of God on earth! The art projects each week are simplistic - intended to "stir" the creative process...there is no formal art instruction. Instead, participants will explore different mediums and materials as "play." The focus of the artwork is NOT the final product but on the “process” of creating something and being unblocked. It involves fellowship, discussion and reflection about what we are learning in the book. In the past workshops, we’ve colored, painted, stamped, made jewelry….mosaics, watercolors, oil pastels, mixed media, scratch art and much, much more! Workshop Fee - $100 (includes materials for each week's art projects). The proceeds benefit the Sozo Creativity Center. Why are we charging? We have expenses (materials, space, advertising).... but please know we're not charging for our time. During this 8-week study, you’ll learn the basics of the art of mosaics. Through Biblical lessons and journaling, you’ll create a vibrant stained glass charger plate - serving as visual representation of your spiritual journey! Peace by Piece is a hands-on, creative study that embraces our brokenness. Women are encouraged to fellowship, relax and heal in a safe and loving environment. It’s time to find the peace you’ve been looking for! $60 fee covers all costs: a keepsake journaling workbook, project materials & stained glass and allows for cutting tools to be utilized during class time. ***Are you struggling to the point where $60 is not possible? Email: jess@peacebypieceministries.org. Our mission is serve ALL WOMEN who want to participate in this study regardless of cost. Don't know much about the Bible? Then this IS the study for you! Thanksgiving Baskets being delivered to 7 families in need. On Tuesday September 25th at 6:30pm we will be doing our annual prayer walk where we will go throughout our city and pray for our community. We will meet at Central Square 222 E 9th Street, Lockport in the third floor Council Chamber. From there, will be briefed and divide up into groups of 2 and 3 to walk or drive to various parts of our city to pray for that part. Some groups will go to schools, others neighborhoods, others churches, some businesses, as well as our police department, etc..
We will pray throughout the city for about an hour and then meet back at Central Square Council Chamber to share some of our experiences. In the past there has always been some wonderful encounters with God’s Spirit! Please share this announcement with your church or group and invite everyone to join us in an evening where we bathe our city in prayer. SEATING IS LIMITED TO FIRST 200 SPOTS, SO REGISTER NOW TO RECEIVE A COPY OF BOB'S NEW BOOK! Calling all Christian entrepreneurs, business owners, ministry leaders and visionaries! Do you have a DREAM that's SO BIG..so consuming in your heart...that you just KNOW it's from God? Allow Life Changers 180 the opportunity to show YOU how to deliver your SPECIAL GIFTS to a world that needs your talents. Join us to learn the 3 CRITICAL STEPS FOR HIGHLY SUCCESSFUL PEOPLE. This free workshop will cover how to create a system that works (and a surrounding that wins) in order to IGNITE YOUR LIFE! Dr. Bob Dudley is a proven, Christian success coach and a Senior Partner at Life Changers 180, LLC. Bob is a self-made millionaire whose calling is teaching others how to LIVE & BREATHE SUCCESS! Bob's deep wisdom, entrepreneurial experience, and strong faith have uniquely positioned him to help you GROW THAT DREAM you have for your business or ministry. Bob is a retired Air Force Officer with extensive experience in the Aerospace industry. He has 5 college degrees: BS in Physics, BS in Aerospace Engineering, MS Astronautical Engineering, and MA & ThD in Biblical Studies. Bob also owns 3 real estate investment companies that allow him to fund evangelism training, crusades, and revivals in third world countries. No Classes on 10/29 or 11/26. 12/17 is a post-class gathering (optional). This workshop is aimed at freeing your creativity. Discover (or rediscover) your creative self! Yes, you can! This 12-week workshop is based on "The Artist's Way" book by Julia Cameron and will be facilitated by Jess Olivito and MariJayne Manganiello. Join in readings, discussions, and, yes, art-making! Will include coloring, painting, jewelry, mosaics, watercolors, oil pastels, mixed media, scratch art and much, much more! Because of the book's fabulous content, we wanted to offer this opportunity to others in our circles. Especially those who feel “creatively blocked.” Self-care is the focus of the course...suggesting that you to take yourself on little creative adventures for 1....known as “Artist Dates”… it’s just an eye opening experience! The art projects each week are simplistic - intended to "stir" the creative process...there is no formal art instruction. Instead, participants will explore different mediums and materials as "play." The focus of the artwork is NOT the final product but on the “process” of creating something and being unblocked. It involves fellowship, discussion and reflection about what we are learning in the book. Have a couple of conflicts during the course of the workshop? No problem, you can miss a couple classes and still be able to function, as long as you're reading the book. Workshop Fee - $100 (includes materials for each week's art projects). The proceeds benefit Peace by Piece Ministries. Why are we charging? We have expenses (materials, space, advertising, websites, etc).... but know we're not charging for our time. The book can be bought on Amazon for under $20 or found at used book stores. *Are you struggling to the point where $100 is not possible? Indicate your need for a scholarship (and what you can afford) by emailing jess@peacebypieceministries.org for other arrangements. Our mission is serve all who have a strong desire to participate!!! Julia Cameron talks about tools for learning to nurture ourselves. During this 8-week study, you’ll learn the basics of the art of mosaics. charger plate - serving as visual representation of your spiritual journey! Peace by Piece is a hands-on, creative study that embraces our brokenness. Women are encouraged to fellowship, relax and heal in a safe and loving environment. It’s time to find the peace you’ve been looking for! ***Are you struggling to the point where $60 is not possible? Indicate your need for a scholarship by emailing dee@artclassesbydee.com. Our mission is serve ALL WOMEN who want to participate in this study regardless of cost. **There will be no class on July 2nd in observance of Independence Day. Grab your girlfriends and join us June 9th! We'll be creating STRING PALLET ART. Cost is $20 (includes light refreshments). Babysitting will be available. E-mail Amber Quade at amberjquade@gmail.com to reserve your spot. Anyone seriously pondering Ephesians 4:11, realizes that "marketplace ministers" are very advantageous in truly advancing the Kingdom of God. In partnership with Kingdom Construction Crew Ministries, Inc., The Sozo Group provides opportunities for commissioning, licensing, or ordination. If this interests you, please click through to get more information on the training details. Our next class runs all summer. This is a spiritual workshop aimed at freeing your creativity. Discover (or rediscover) your creative self! Yes, you can! 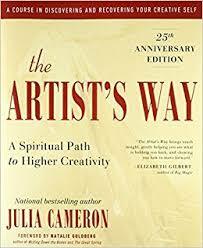 This 10-week workshop is based on "The Artist's Way" book by Julia Cameron and will be facilitated by Jess Olivito. Join in readings, discussions, and, yes, art-making! Because of the book's fabulous content, we wanted to offer this opportunity to others in our circles. Especially those who feel “creatively blocked.” Self-care is the focus of the course...suggesting that you to take yourself on little creative adventures known as “Artist Dates”… it’s just an eye opening experience! Summer vacations planned? No problem, you can miss a couple and still be able to function, as long as you're reading the book. Workshop Fee - $100 (includes materials for the weekly, small art projects). 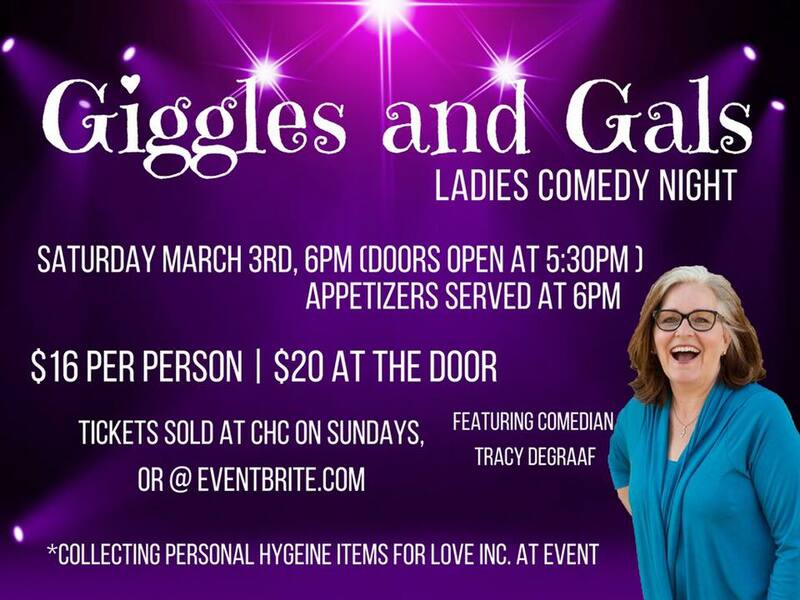 Proceeds will benefit the mission of The Sozo Group & Peace by Piece Ministries. Why are we charging? Ministries have lots of expenses (materials, space, advertising, websites, etc).... but please realize we are not charging for our time. The book can be bought on Amazon for under $20. *Are you struggling to the point where $100 is not possible? Indicate your need for a scholarship by emailing jess@thesozogroup.org for other arrangements. Our mission is serve all who have a strong desire to participate. Are you a single mom? Do you like to be pampered? Would you like a day of relaxation? Come on out May 19th from 11AM- 1PM to Thrive Church. This event is at Taft Elementary School in Lockport, IL. We will have free massages and manicures, free mini session with a photographer, a free jewelry boutique, kids crafts and stories, car washes, free washer fluid fill up, free lunch and coffee, goodie bags, and so much more just for YOU. RSVP to Thrive so that they know you're coming! BICYCLES!!!! Now that we have your attention, it's time our annual bicycle ministry kickoff. Lockport Resource Center, Lockport Love and the Lockport Police Department are collecting gently used bicycle donations. Together, we tune up the bikes and prepare to sell them through the "Pass It On" Thrift Shop. Proceeds fund our Transformation Scholarship Program. Bicycles are also given to those in need, in keeping with the LRC mission. Bicycles can be dropped at the Lockport Police Department between 9am and 5pm until May 15. Please be considerate by not leaving donations outside business hours. Cash donations toward needed repairs or the Transformation Scholarship Program are also welcome. On May 19th, we need volunteers for light bicycle repair and maintenance. We clean them and then transport them back to the store, take pictures of them, bring coffee...We like to make them look pretty and run well for the kids. Contact Lockport Resource Center for more information. The National Day of Prayer is May 3rd, 2018. There are multiple prayer services happening locally. Please come out and join us as we lift up our nation in prayer. Please invite your entire church. We're joining churches and groups across the country that will praying alongside of us, praying for our nation. 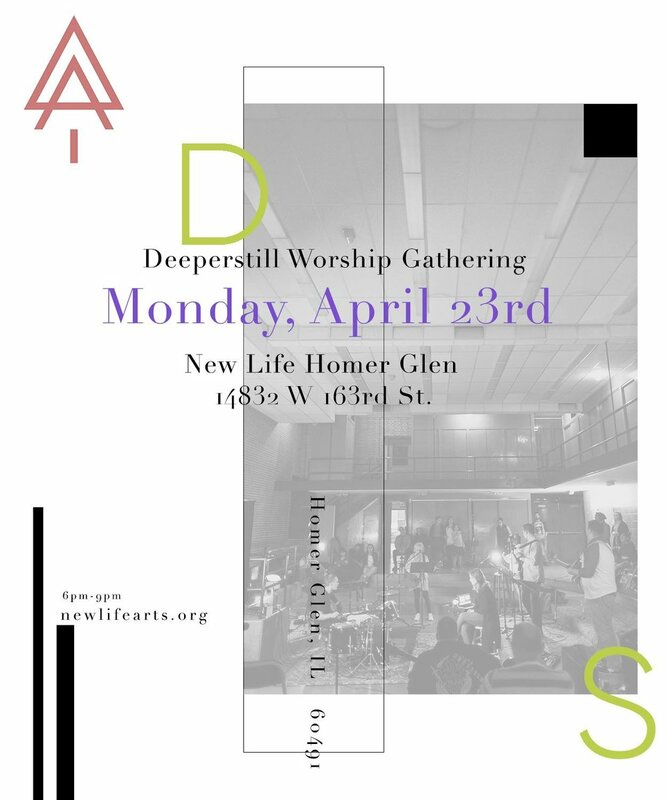 Deeperstill Worship Gatherings happen every last Monday of the month. They're our monthly nights to fellowship and worship as a community. No featured musicians, no featured speakers, no featured artists, just a large community gathering with nothing on the agenda other than to dig deeper in the presence of God. These look different every month as we meet in different parts of the city, and have different people there. We'd love to worship with you any month. Visit www.newlifearts.org for more info. ATTN: CHURCH LEADERS & EVANGELISTS! TAP INTO THE PRESENCE OF GOD. HEAR GOD'S VOICE AS A TEAM. ACTIVATE & STIR YOUR GIFTS & CALLINGS. PARTNER WITH OTHER LOCAL CHURCHES & COMMUNITY LEADERS. Sr. Missional Pastor Mike Abron will be working with local pastors and church leaders IN UNITY to tap into the presence of God as a community - as the body of Christ who's able to penetrate the darkness that exists in today's marketplace. We will discuss Jesus as the primary example of an evangelist, church planter, prophet, teacher and apostle. Mike will then walk groups through a series of questions that will help them identify their specific callings, as well as their corporate callings for purposes of outreach evangelism. We pray that you will join us and send your ministry leaders. Simply RSVP to jess@thesozogroup.org or (312) 731-8970 with the number attending from your church for meal planning/organizational purposes. Enjoy a relaxing weekend away at Hyatt Regency Schaumburg just minutes from Woodfield Mall. Amenities include modern & luxurious guest rooms, free guest parking, complimentary WI-FI, and hotel shuttle services. Breakfast IS included for overnight guests at the Fresh 1800 Restaurant & Bar serving farm-to-table cuisine. The hotel features modern conference facilities, a stylish indoor pool, and a 24-hour fitness center. Retreat Closes on Sunday @ Noon. Register Early & Save $10 if purchased by December 31st. Retreat Ticket is $105 after December 31st. Registration Deadline is January 25, 2018. 2) Contact Hyatt Regency for your hotel reservation. Mention you're with the retreat for discounted rates! Rates vary depending on the number of people staying in your room. If you'd prefer to room solo, 2 nights will cost you approximately $210. For those looking to minimize costs, 4 women sharing a room (2 nights) is approximately $69/person. Amenities include modern & luxurious guest rooms, free guest parking, complimentary wi-fi, and hotel shuttle services. BREAKFAST IS INCLUDED for overnight guests at the Fresh 1800 Restaurant & Bar serving farm-to-table cuisine. The hotel features modern conference facilities, a stylish indoor pool, and a 24-hour fitness center. 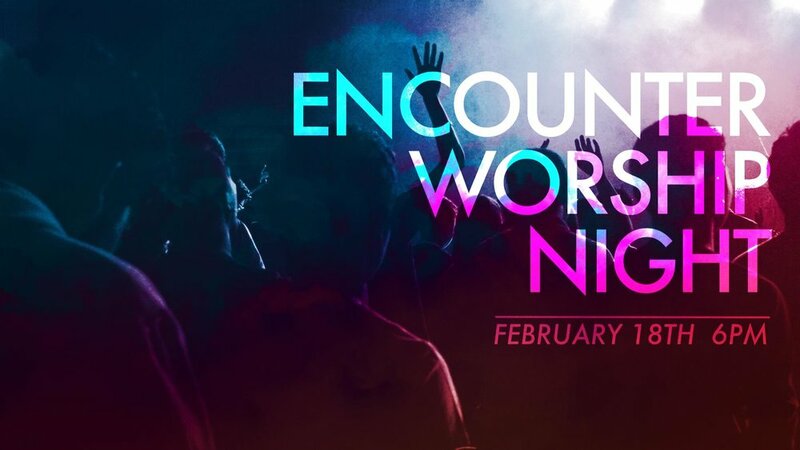 Join Thrive Church for a night of worship and prayer. We are excited to kick off the new year in a powerful way honoring and connecting with our God, and we hope that you can be a part of this amazing time with the Lord. Invite your friends and family to join us this special night. The Watering Hole is pleased to welcome our very own Paulette Horvath. Paulette is one of the founding board members of the Watering Hole. She loves to see people walking in their destinies and following the Holy Spirit. She is a lover of Jesus and loves to worship Him. Life is all about His Presence and seeing the Kingdom of God manifested. She is an ordained Pastor. Currently, Paulette is a facilitator for the School of the Supernatural from Bethel Church’s DVD school. Paulette has been teaching from the Heart of God for many years. Her teachings are anointed to impart wisdom and revelation. She comes prepared with a Now Teaching and a Prophetic Word. Her teaching refreshes, renews, and restores. Her ministry brings healing and deliverance. The Lord has used her to teach, preach, prophesy and encourage the Body of Christ in the US and internationally. She is a lighthouse for the Kingdom of God. Paulette leads the Body to safety and direction during the storms of life. Come and let your heart be set free. Please join us for a blessed time in Jesus! Hope Center is a about 2 miles west of 355 on the north side of the street. It is in the corner section of a strip mall. The strip mall is between Preston Road and Pinecrest. There is car wash on the corner of Preston and Boughton Roads. The strip mall is accessible from Preston Road or Boughton Road. There is parking in the front and rear of the mall. Bring an expectant heart. Bring a friend. Bring a dish of food to share (if you can). Parking & shuttles available from Moody Bible Institute at N Wells & W Institute. Join thousands at March for Life Chicago 2018 as we come together from across Chicago, the Midwest and the U.S. to defend, protect and celebrate LIFE! Tickets are $15/each if purchased before 11/9. lives in the Chicago area with her husband "Muffin"and their "Mini-muffins." Join Ha Ha Men at Fountain of Life Church for "Good for the Soul," a free monthly improv comedy show. Ha Ha Men is a clean comedy troupe that dedicates their comedy to honoring God. Find out more HERE. Join us for FREE, family-friendly entertainment featuring: Ha Ha Men's Comedy and Improv Troupe, After the Rain Band Shiloh Missionary's Gospel Choir, & Chicago’s Renew Movement (Headliner Concert). There'll be free popcorn, kids activities, and a bounce house/obstacle course for the kids! Food trucks will also be onsite. Outside coolers are allowed, no alcohol. One Church praying with a purpose. A partnership of PrayChicago, Chicago Prays, Red de Ministros, Chicago Pastors Rally, Pray Naperville, Pray Fox Valley, Pray South Holland and many more. We are calling Chicagoland to unite in prayer, trusting the God will do a great work in our city and in His Church to engage the needs of our region.